Mornings are my favorite time of the day. As the sun comes up and the night gently fades away, all life is awoken by the warm rays of sunshine and sounds of the dawn fill the air. Two of my best mornings this year were during my trip to the Pacific Northwest. 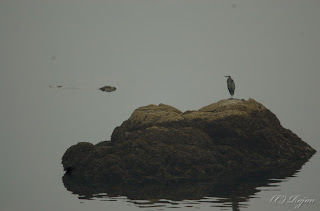 Specifically I'm talking about my two mornings waking to the sights and sounds of Anacortes. 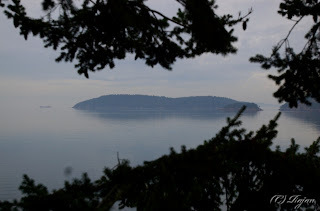 Anacortes is a beach town situated about 80 miles to the Northwest of Seattle close to the Vancouver Archipelago. There we stayed at the Heron Hill Inn and Suites, a Bed and Breakfast. We reached there after nightfall and couldn't really see anything much. The narrow roads and winding roads did look scary! The gentle lapping of the waves along the coast as we checked in was a welcoming sound. A whole different view of the bay awaited us the next morning! The famed Seattle drizzle during the night just changed everything. 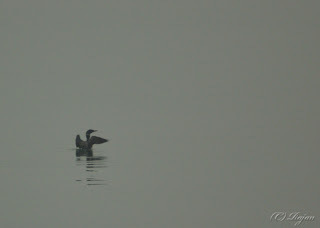 The bay was covered with a blanket of fog, and one couldn't see those islands visible the previous day! A lot more birds could be heard and seen this morning. 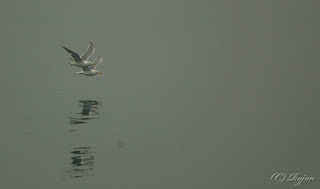 Herons, gulls and loons were up and out looking for food. We sat there amazed how one day could change the view of the same place so much.